In order to raise funds to support the art, culture, vocational and educational programs here at the Alliance for Independence, our Artists are literally raising the roof! For a donation of $100.00, AFI Client Artists will create a masterpiece on a new ceiling tile which can be displayed at your place of business before being placed in the ceiling of AFI’s “Cafetorium”, the all-purpose room where AFI clients gather for everything from daily lunches to holiday dances. The Artists will leave room on the tiles for names and inscriptions allowing donors to honor or memorialize loved ones or, just send well wishes. The project allows our clients to work as a group to make choices as they brainstorm and vote on tile designs, express themselves through new art mediums and techniques, and actively engage in beautifying their environment, all while raising much needed money to support our programs. 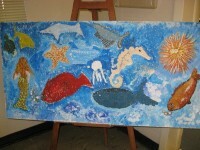 It takes about 1 week to complete each tile, all net proceeds from this project will benefit Alliance for Independence. To purchase a tile, or for more information, please call Dan Berman at (863) 665-3846 ext. 222, or email dberman@afi-fl.org.